The Jordan Movie Blog: Now THAT'S a Playground! On Friday, after leaving work early to experience the goodness that is District 9, I joined up with Lori and the kids at a nearby park in Mclean. She was taking the kids to Clemyjontri Park after their naps to meet up with her friend and her toddler son. When she first told me they were going to this park I immediately thought "Clem-what? Park?" After I pulled into the spacious parking lot I instantly knew that this was no ordinary park. The area was canvased with colorful playground equipment, swings, tunnels, ramps, cars, fire engines, mazes, see saws, monkey bars, ziplines and just about anything else a kid could want at a local playground. It took me some time to locate my family amidst the array of apparatuses. Once I found them I realized Josh and Alex had already been running full-bore across the sprawl of fun. They were both beat red and chock full of energy. I have to admit, I was pretty psyched to roam around the grounds myself. I especially enjoyed the maze that I could see over but Josh and Alex could not. We let Alex lead the way and he used his surprising navigational skills to get out of the maze rather quickly. The two acre playground is sectioned into four areas that have specific focus concentrations. The entire surface of the park is made up of soft rubbery material that cushions any potential accidents that may occur. The downside of this type of floor covering (coupled with the fact that it was very humid on Friday) is that the park gets very hot rather quickly. After just 15 minutes of playing with the boys I was dripping in sweat (thanks to the pair of jeans I wore to work on casual Friday). 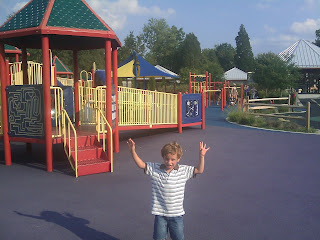 I'm really hoping I can get my Mom out to this park when the weather cools down. The entire park is handicapped accessible and she could easily get around in her power chair and watch the kids go nuts. I'm surprised I hadn't heard about this crazy park with the crazy name before. I believe Lori had and I'm glad she took the kids there. I'm sure this won't be our only visit to "the playground to end all playgrounds." Enjoy a quick video of Josh working the "zipline" with a random Batman kid watching. Amazing! Why is it called that name? From the website: The name CLEMYJONTRI is derived from the donor’s four children: Carolyn (CL), Emily (EMY), John (Jon), and Petrina (Tri). Is it free? That is the question biggest in my head. If not, how much? It's 100% free. There's an outside chance we may have Josh's next birthday party there. It does cost to rent the pavilion for parties but it's only $85 a half-day.